If you are using CyberChimps Responsive theme and you’re seeing a blank home page or getting a 404 error on the home page of your website, then this article will show you how to solve the blank home page or 404 on your home page. Reason for the home page to be blank? The reason you’re getting a blank screen on your home page is because the template is set to “Default template”, whereas the template should be set to “Content/Sidebar” template on the home page. Under template option, choose “Content/Sidebar” as the template and click on update. Once you made made the changes, visit your website now there should not be any 404 error on the home page. If you want to make any page your home page, edit the page and make sure to change the template to “Content/Sidebar” and click on update and your home page should start working fine. 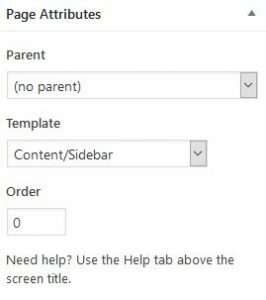 Below is a screenshot where you can change the page template.